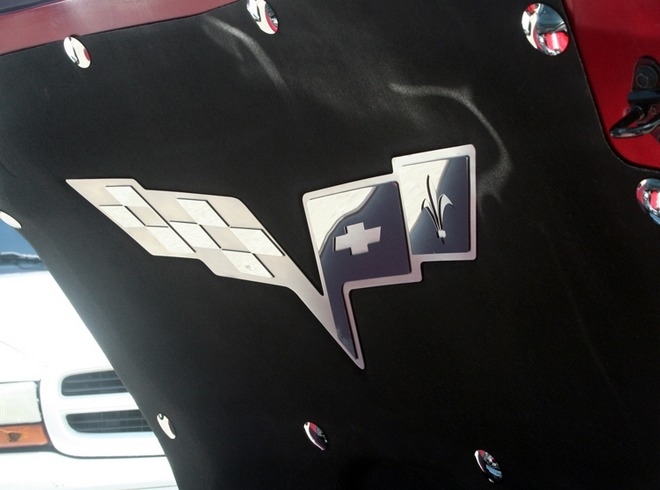 Dress up your 2005-2013 C6 Corvette with our Polished/Brushed - Stainless Steel, Hood Panel Badge "Crossed Flags" only. These trim pieces are designed to fit all 2005-2013 C6 Corvettes on the stock hood pad liner and add a custom stylish look to your Corvette engine bay. Features a multi- dimensional crossed flags. *This is a GM Licensed product. *Features a multi-dimensional crossed flags. *High Polished, mirror finish and Brushed pieces. *Will not tarnish, fade or rust. *Adds a unique look and style to your car. *Easy installation with provided silicone adhesive and needs to cure for 24 hours. Fits all 2005-2013 C6 Coupe and Convertible and Z06 Corvettes. Made in USA!